It was very hard to say good-bye to Grammy and PopPop. (Even though we're actually going back in a month for another visit that had been planned and booked even before they moved!) Zoe doesn't quite get it... but Grammy and I were both a big mess of tears by the time we had to say our good-byes at the security point. We're such saps! 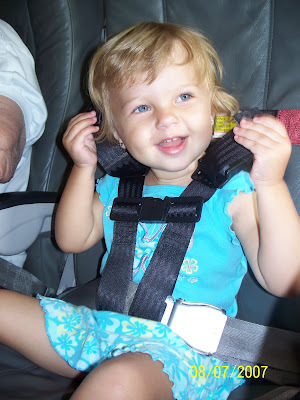 Once we were on the airplane Zoe was ready to sit in her seat. She even helped hook up her seat belt. We had an uneventful flight... and were home in no time. We had such a nice visit with Grammy and PopPop. It was good to see Jim, Erica, and Avery... and Nanny and Pop George. I'm glad we got to see Noah while he's such a peanut! (He'll be as big as Zoe before can blink!) A great visit... but we were still happy to come home! 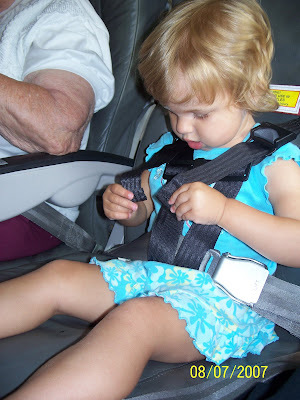 On my post about our flight to Florida Sarah at Cheeze Whiz and Mustard commented and asked if our airplane harness seat belt was worth it... or if it would've been just as good to use the normal car seat. I have to say this was sooooooo much better for us. I will say on the plane it wasn't any better or worse than her normal car seat. (It accomplished the same thing... keeping her stay put). But... the major major benefit... no lugging the car seat around the airport. This thing folds up and fits in it's own little bag that actually fit right in our carry-on bag. 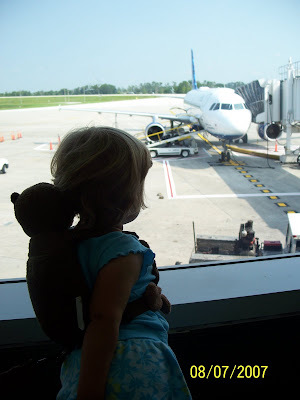 It's hard enough to get a toddler and all her travel needs through an airport... the last thing you want to add is that enormous heavy bulky car seat. The CARES harness... totally worth the money in my mind... especially if you fly a few times a year.